Key Difference: Fear is a feeling induced by perceived danger or threat. Fear is something that indicates to the person that the situation is unsafe and that they should try to get out of the situation as soon as possible. Intuition is the ability to know things or anticipate things without any reason or prior knowledge of things. 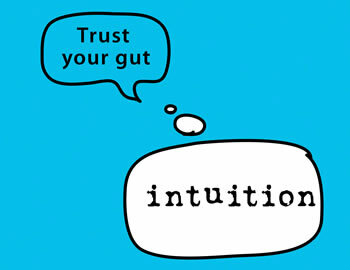 Intuition is also known as sixth sense or gut feeling. Intuition and Fear are two terms that are often used together, so much so that it may be difficult at times to actually tell them apart. What do the terms actually mean? Though they are used together, the terms actually have different meanings, albeit ones that are related. Humans are conditioned to feel intuition and fear, both of which are instinctive in nature. Each of these serves a different purpose, one that helps a person to survive. Fear is an evolutionary response, one that helps a person stay away from things that are not safe for them. Fear is usually induced when a person is confronted with something that they are unfamiliar with or something that presents danger to them. For example, a person would naturally feel afraid if they are standing on the ledge of a building or a cliff and staring down to the floor. Fear is something that indicates to the person that the situation is unsafe and that they should try to get out of the situation as soon as possible. Fear served an evolutionary response so that the person would stay away from things that may harm them, and hence survive for longer. Intuition, on the other hand, is something else entirely. Intuition is the ability to know things or anticipate things without any reason or prior knowledge of things. For example: when a mother knows that her child is hurt even though she is across town or across the country and no one told her otherwise. There have been hundreds of cases such as this. Intuition can also be something less dire, such as a feeling in the morning that today is going to be a good day and it is, regardless of anything specific. Intuition is often referred to as a sixth sense. Intuition may warn a person that something is not right and hence should be avoided. However, fear is something that helps one avoid or get out of a situation that is not safe. Additionally, fear also results in a physical effect that helps cope with danger, such as by an increased breathing rate (hyperventilation), heart rate, constriction of the peripheral blood vessels leading to blushing and vasodilation of the central vessels. It may also increase muscle tension including the muscles attached to each hair follicle to contract and causing goose bumps, which makes a cold person warmer or a frightened animal look more impressive. It also increases sweating, increased blood glucose (hyperglycemia), increased serum calcium, increase in white blood cells called neutrophilic leukocytes, alertness leading to sleep disturbance and "butterflies in the stomach" (dyspepsia). All of these responses help the person in case of a fight on in case they want to run away, i.e. flight. This is what is referred to as the flight or fight phenomenon. Intuition typically does not have any physical effects, though some people may have experience heighted senses or emotions, or other effects depending on how they react to their intuition. Fear is a feeling induced by perceived danger or threat. It may cause a change in metabolic and organ functions and ultimately a change in behavior, such as fleeing, hiding, or freezing from perceived traumatic events. "intuition" comes from the Latin verb intueri translated as consider or from late middle English word intuit, "to contemplate"
“fear” comes from Old English, “fǣr” which means ‘calamity, danger’. The term is also rooted in “fǣran” which means to ‘frighten’. Mother knowing that their child needs them, walking into the room and knowing something isn’t right or safe.